Be the first to share your favorite memory, photo or story of Jemima "Mimi". This memorial page is dedicated for family, friends and future generations to celebrate the life of their loved one. 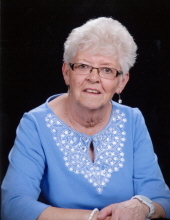 Jemima Mclean “Mimi” Olds, of Rolla, passed away Thursday, April 4, 2019, at the age of 83. She was born in Edinburgh, Scotland on August 23, 1935 to the late John and Sarah (Divitt) Narrie. On January 27, 1956 she married Donald J. Olds, who survives. Mimi was a loving and devoted wife, mother, grandmother and great grandmother. She was an active member of the Immanuel Lutheran Church in Rolla for the past 50 years. She was also a member of the Rolla Optimist Club and a volunteer for the Phelps Health Auxiliary. In addition to her parents, she was preceded in death by an infant son, David Olds; one brother, John Narrie; and two sisters, Mary Grace and Sylvia Narrie. Mimi will be greatly missed by her surviving family which includes her husband of 63 years, Don Olds, of Rolla; three children, Steven Olds and wife Lisa, Kathy Delamotte and Scott Olds, all of Rolla; a brother, Andrew Narrie, of Tampa, FL; two sisters, Jenny Miles and Agnes Swanson, both of Scotland; four grandchildren, David Olds, Devin Olds, Jimmy Delamotte, and Brooks Delamotte; eight great grandchildren, Drake, June, Eden, Lane, Taylor, Cody, Lindsay, and Tinsley; a host of nieces and nephews, other extended family members and many dear friends. A funeral service celebrating the life of Mimi Olds will be held at 1 pm Monday, April 8, 2019 at the Immanuel Lutheran Church in Rolla. Interment will follow in Ozark Hills Memorial Gardens Cemetery in Rolla. A visitation for family and friends will be held prior to the service Monday beginning at 11 am at Immanuel Lutheran. Memorial contributions are suggested to Immanuel Lutheran Church. To send flowers or a remembrance gift to the family of Jemima "Mimi" Mclean Olds, please visit our Tribute Store. Spring Ave and W. 11th St.
"Email Address" would like to share the life celebration of Jemima "Mimi" Mclean Olds. Click on the "link" to go to share a favorite memory or leave a condolence message for the family.